Chakra is a Sanskrit word meaning "wheel", symbolizing the “wheels” of energy in your body. 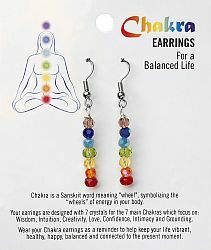 Your earrings are designed with 7 crystals for the 7 main Chakras which focus on: Wisdom, Intuition, Creativity, Love, Confidence, Intimacy and Grounding. Wear your Chakra necklace as a reminder to help keep your life vibrant, healthy, happy, balanced and connected to the present moment.